“The Gift Basket” is the story of a Luiseño girl who decides to make a special gift basket for her grandmother. When she discovers that someone has taken all of the basket weaving plants from her family’s gathering area, the Animal People come to her aid. The setting of the story is the pre-contact period in San Diego, California; the home of the Luiseño people. 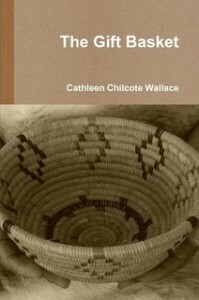 The story is filled with accurate historical facts of early native life in Southern California including: homes, food, clothing, native plants, and gathering practices still used today. The native practice of conservation, ecology, and respect for the environment is one of the main themes of the story. “The Gift Basket” is an original story that can be used across the curriculum. In addition to supplementing a social studies unit, the learning can be extended to language arts, science, and art. It is the perfect “springboard” to launch a unit of study. The story coordinates with The Gift Basket Storytelling Presentation. The book has no illustrations. It was designed for the reader to draw her own illustrations, making the story her own. This is perfect for a read aloud, shared reading or independent reading for older children. The book includes a glossary and San Diego native history background information for teachers and parents.